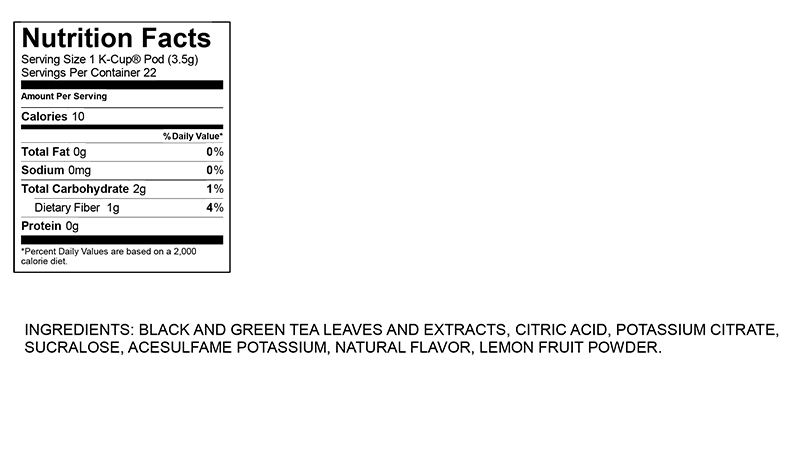 Tasty tea and tangy lemonade blended together for a flavor combination that is sure to please. I should have know better buying something diet. It has the most horrible aftertaste. I don’t even want to try the Diet Peach Tea now. Need to find someone to pawn this off on. This is delicious and the best part is you can adjust the sweetness and potency but adjusting the cup size! I love this tea! I am diabetic and this satisfies my need for something sweet. It is also not boring like regular tea! Love it and will keep buying it! Excellent tasting diet iced tea w low carb (sugar) for diabetics. Great replacement for Diet Snapple Lemon which I loved & was discontinued. Though I personally don't taste the lemonade, it does have a subtle different taste from the Diet Snapple Lemon. I'm picky & this is delightful! I love this tea!!! The convience is so so great. I drink at least 3 pods a day. The glass bottles are no more!!!! I love this tea! The mixture of tea & lemonade is unbelievable. I am a diabetic and this is great for me. It has a little sweet taste that satisfies my sweet tooth. I would recommend this to everyone and I will continue to order. This is a great summer drink. I'm no longer able to find this in my local stores, so I'm thrilled to find it on your web site. This is a perfect lemonade/ice tea! The price is also fantastic-especially for 22! Sickeningly sweet. Left a fake sweet taste in my mouth. Threw them all out. I have looked for a tea that doesn't take away all the tea taste with lemon and I finally found one!! Thank you! !